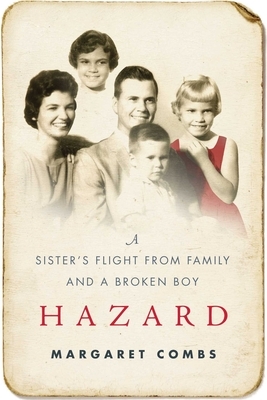 Hazard is a poignant, unflinching memoir of the emotional intricacies of growing up with a severely disabled sibling. Margaret Combs shows how her Southern Baptist family coped with lived reality of autism in an era of ignorance and shame, the 1950s through the 1970s, and shares her own tragedy and anguish of being torn between helping her brother and yearning for her own life. Like many siblings of disabled children, young Margaret drives herself to excel in order to make up for her family’s sorrow and ultimately flees her family for what she hopes is a normal” life. Hazard is also a story of indelible bonds between siblings: the one between Combs and her sister, and the deep and rueful one she has with her disabled brother; how he and she were buddies; and how fervently she wanted to make him whole. Initially fueled by a wish that her brother had never been born, the author eventually arrives in a deeper place of gratitude for this same brother, whom she loves and who loves her in return. Margaret Combs is an award-winning journalist who began her writing life as a National Public Radio reporter and education correspondent for the Boston Globe. She is a recipient of both the Associated Press Award for Arts Reporting and the United Press International Award for Best Documentary. Excerpts from her book have appeared in literary magazines, including the North American Review (NAR) and Lost Magazine. She was a finalist for the NAR s 2015 TORCH Memorial Prize. She lives on Bainbridge Island, Washington."